Where is the best place to live in the UK? Sure, it is an interesting question to pose but the answer will always come down to individual tastes. What suits one person may not suit another. Some people want to live in a rural idyll while others could not stand the idea of residing far from a bustling and lively city centre. That said, there are some factors that we can all take into account when thinking about the best place to live. So long as you know what you want, all it comes down to is finding the perfect property in your desired location. What are the factors that make some places in the UK really stand out from others? Rightmove recently revealed that Leigh-on-Sea in Essex was the happiest place you could buy a home in the country. The coastal town was deemed to be happy because of its choice of shops and restaurants along with a strong community spirit. Other happy places in the UK include Royal Leamington Spa, in Warwickshire, Farnham, in Surrey and Monmouth, in Wales. If you want to live in a picture-postcard town or village in the UK, then there is plenty of choice. Some of the best kept secrets in real estate include those out-of-the-way hamlets and villages which are picturesque from every viewpoint. Historic places tend to score highly with homeowners who rate prettiness as a crucial factor in where to live. As such, cities like Bath and Canterbury are good choices. You can also find picturesque residences in Chichester, Penzance and other coastal towns, like Oban, in West Scotland, and Barmouth in North Wales. There is one way you can tell when a place is up-and-coming – the growth in property prices. If making a sound financial investment is what you are after from the place where you live, then looking for the highest rates of growth will be important to you. Places like central London may demand the most money but asking prices are not necessarily growing as they once did there. According to recent government figures, the East Midlands and Wales offered the greatest growth potential, albeit starting at a lower base. Cities like Nottingham were increasingly popular in 2018 with no sign of change in the early part on 2019. According to the online estate agent Yopa, Ashbourne in Derbyshire is the best place in the country to raise a child. Low crime, affordable house prices and good schools all contributed to its high score. It’s also relatively close to Alton Towers, for better or for worse! For some people, it is the access to the local cultural scene which makes one place better to live in than any other. You don’t need a big summer festival – like Glastonbury – to come around to make a place worth living in from a cultural point-of-view. Towns with a regional theatre, a good live music scene and access to cinemas all attract people who are moving. Bournemouth is a place which has its own well-respected orchestra and all of the cultural attractions you could wish for. The city of Edinburgh has one of the most vibrant and diverse cultural scenes in the whole country with one of the largest arts festivals of anywhere in Europe. Hay-on-Wye, situated in the historic county of Brecknockshire in mid-Wales, is another great place to live, with an abundance of bookshops and a famous summer literary festival that takes place each year. There again, Buxton in Derbyshire, has a charming, if small, regional opera house that is much-loved by its residents. In the UK, we don’t often think of ourselves as a friendly lot even if we are a bit more approachable than we imagine. Some places have a reputation for unfriendliness which is definitely unwarranted. That said, towns like Houghton in Cambridgeshire and Keswick in the Lake District have earned themselves a good deal of trust among their residents for being friendlier than average. Other places with a reputation for good neighbourliness include Stornoway, York and Falmouth. 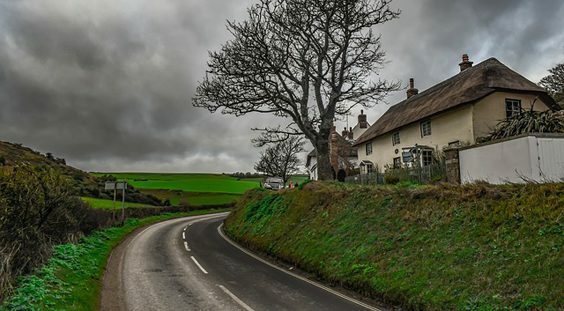 Shaftesbury, in Dorset, is said to be another friendly place you could move to. What’s more, it is an extremely picturesque place to set up home in, as well!